This weekend, the sensational Liverpool International Musical Festival returns to Sefton Park for a four-day celebration of musical heritage and cultural diversity. 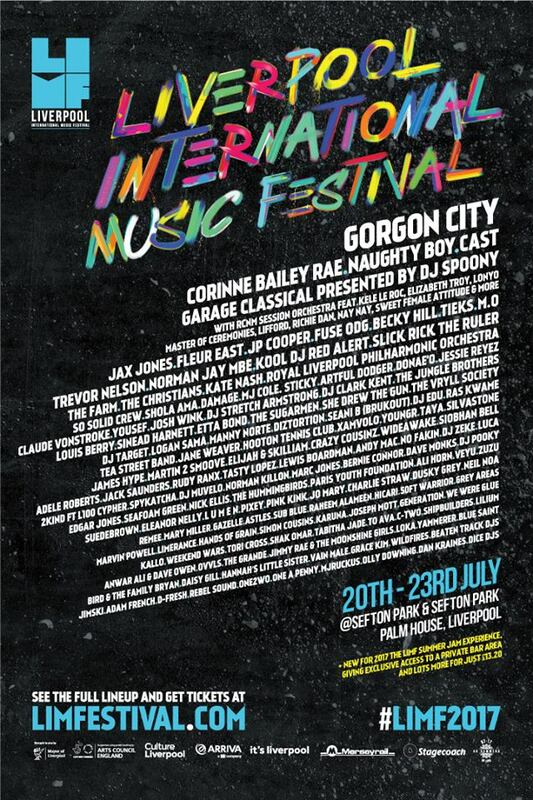 This year’s headliners, Gorgon City, Naughty Boy and Cast, are set to wow the masses. But, if it’s emerging, under-the-radar acts you’re after, we’ve selected five exciting performances that you will not want to miss at this year’s free Summer Jam event in the park. The festival has also worked with local promoters of new and emerging music who put together The Smithdown Road Festival and have put together an aftershow programme taking place nearby in some of our favourite Wavertree haunts such as Evil Eye and Craft. You’ll find bands such as The Strange Collective, Ovvls, Lyons & La Zel and a second set from We Were Glue all taking place along with a smart picking of other acts all looking to keep the LIMF vibes going after dark. Full info on the aftershow can be found here. Zuzu are undoubtedly one of the best upcoming female-fronted bands that Liverpool has to offer right now. Their two singles Get Off and What You Want are loaded with timeless La’s melodies and candid lyrics to rival Courtney Barnett’s. After impressing crowds this year at Radio 1’s Big Weekend, Future Vibes and Sound City, this Mossley-Hill raised singer/guitarist and her band are guaranteed to get you off. We Were Glue are one of 20 artists/bands making it into the LIMF Academy – the award-winning talent programme. Picture Two Door Cinema Club with a Scouse twang. The future looks bright for these young Liverpool based lads, with their first EP My Girl featuring on Spotify’s The Indie List. Their upbeat energetic indie pop will have you bopping away at the Academy Stage. After signing to Liverpool’s Skeleton Key Records, also home of The Sundowners, Marvin Powell has played huge support slots for The Coral and John Cale. His poetic psych-folk, with its melancholic melodies has been likened to Ryley Walker and Arthur Lee. Get fully immersed in his haunting acoustic set and you’ll not be disappointed. Since the release of Ali Horn’s debut single Days Like Today, his psychedelic indie surf-pop has been making waves in Liverpool and beyond, attracting the attention of Radio 1 and Radio 6 Music. You’d normally find Ali playing guitar in The Strange Collective, or hiding behind layers of reverb and delay, so don’t miss this opportunity to see him perform in a stripped-back acoustic setting. Electro-pop singer-songwriter LUNA takes her influence from artists such as Kate Bush, Grimes, Banks and The 1975. Her atmospheric beats and mystical vocals have earnt her national radio-play and festival slots at Sound City, Pangaea Festival and Mersey River Festival. See this fast-rising star illuminate the stage on Sunday afternoon.